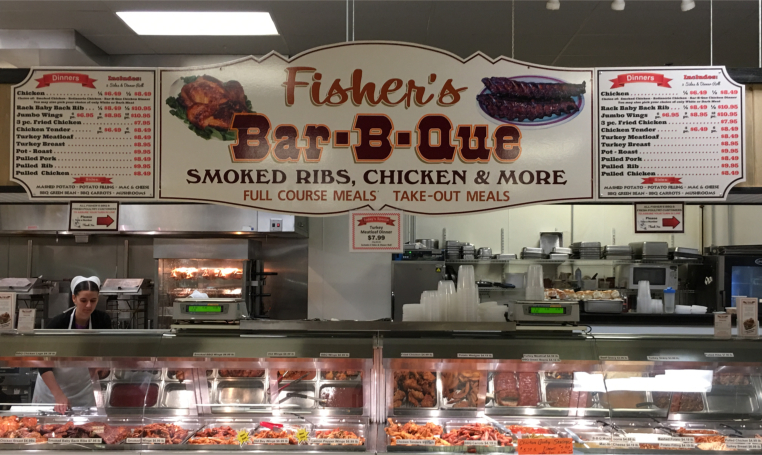 The Farmer’s Market of Wyomissing is pleased to have Fisher’s Bar-B-Que as a vendor at the market. Our stand is located to the right rear of the building near the in-house dining area. You can contact us by phone at (610) 374-3300 or fax at (610) 374-1917. Fried Chicken platters that come with two sides and a roll. There are also Rotisserie Chicken platters and Smoked Ribs platters. Our sides are potato wedges, mashed potatoes, mushrooms, green beans, mac and cheese, turkey chili, carrots, filling and gravy. We also have Fried Chicken by the piece and Chicken Fingers, Whole Rotisserie Chicken, Smoked Ribs, and sides by the pound. Along with these items we have hot and mild sauces, water, lemonade and homemade root beer available in bottles, quarts, and gallons. 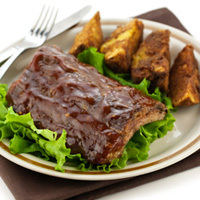 Our meals are eat-in or take out and we also offer party trays. The Farmer’s Market of Wyomissing is pleased to have Fisher’s Fresh Poultry as a vendor at the market. Our stand is located to the right rear of the building near the in-house dining area. You can contact us at (610) 374-3300. 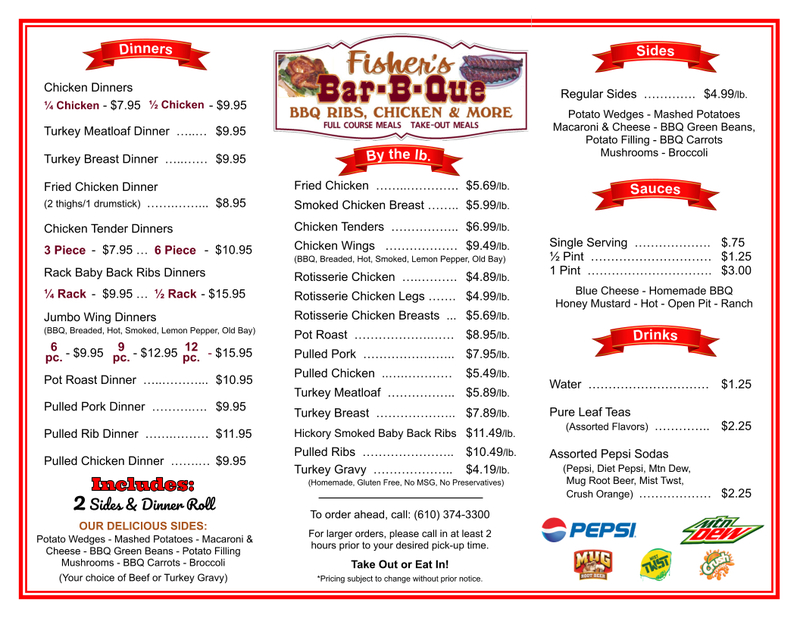 Fresh chicken available as a whole, in pieces, bone-in or boneless and many other cuts. We also have fresh turkey as a whole, in pieces, legs, breast only, or ground including turkey burger patties. As well as sausage, meat loaf, GMO free, hormone free, free range eggs & breakfast links, rabbits & duck, smoked duck breast, smoked turkey baloney, turkey steak, turkey jerky, smoked turkey chops, cordon bleu stuffed chicken breast, turkey & chicken bacon and turkey chili.